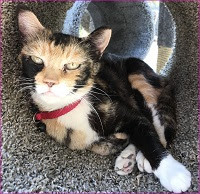 Carrie Kennersly loves her part-time job as a part-time veterinary technician at the Knobcone Veterinary Clinic, almost as much as she adores owning her human and canine-catering bakeries. So she’s optimistic that the clinic is holding interviews for a retiring veterinarian, especially since the applicants were referred by her boyfriend, full-time clinic vet Dr. Reed Storme. Carrie’s hopes are immediately dashed by the unanticipated and unasked for arrival of another of Reed’s former San Diego coworkers, the seductive and arrogant Raela Fellner. Reed had then found that her incompetency and lack of ethics outweighed her attractiveness, and Raela seems intent on her revenge by slandering the Knobcone Clinic and vowing to open her own competing one. Reed’s opinion of Raela hasn’t improved, and when she is found dead from an overdosed used to euthanize pets, he becomes the obvious suspect. As much as Carrie admires Reed, even she has her moments of doubt over his innocence. While her greed and callous treatment of animals were detestable, Raela didn’t deserve to be murdered. Carrie’s impressive record of solving mysteries before the police means that she will not hesitate to find out the truth, and for once Reed is encouraging her endeavors. For the rest of the Knobcone community in the San Bernardino Mountains, Carrie’s predilection for detecting is as familiar as her miniature poodle/terrier Biscuit, so not even the police are surprised that Carrie hurtles herself in to the investigating the life of a woman who left so many unhappy men in her wake. Carrie has a rather entitled attitude towards her involvement in murder investigations, but the results would seem to back her up. Even though she does nearly stumble upon the solution, readers will be hard-tasked with figuring out the solution before our pet-loving heroine. Her unwavering dedication to find the killer puts her on the receiving end of more than a few threats, but it also proves to be the push to force out a ruthless criminal. Animal lovers will appreciate the pet-adoption events that have her advocating for the rescue of so many lovable dogs, and mystery lovers will appreciate Carrie’s attempts to sway dog-owning police officers with Barkery delights. A recipe for Peanut Butter Dog Treats should have even reluctant bakers eager to indulge their fur-babies, and there’s even a Make-in-My-Sleep Brownie recipe included for the humans. Readers who enjoy their mysteries with a celebration of their furry companions will revel in the latest entry of this pet-centric series. 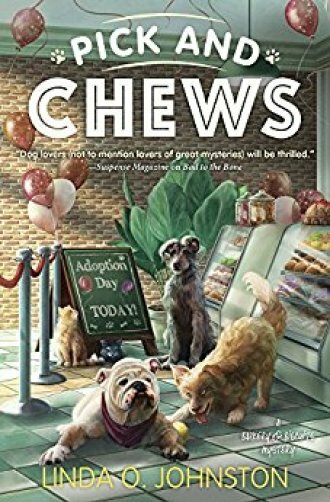 To enter to win a copy of Pick and Chews, simply email KRL at krlcontests@gmail[dot]com by replacing the [dot] with a period, and with the subject line “chews,” or comment on this article. A winner will be chosen June 30, 2018. U.S. residents only. If entering via email please include your mailing address (so if you win we can get the book sent right out to you), and if via comment please include your email address. You can read our privacy statement here if you like. Check out other mystery articles, reviews, book giveaways & mystery short stories in our mystery section over on Kings River Life and the Mystery section here at KRL News & Reviews. And join our mystery Facebook group to keep up with everything mystery we post, and have a chance at some extra giveaways. Also check out our new mystery podcast that just went up on June 5! Thanks for the chance to win this book. Sounds very good. This sounds like a great book. I like books featuring pets in the storyline. Thank you for the chance to win this! Have been interested in the series but not yet read any in it.